Hello there! If you remember, I posted about this property at 111 Little Bear Trail last year about this time (and posted an update last week). At any rate, as you can see, the house is up for sale again. The house did sell last year (under land contract), but that didn’t work out. The title is clear and the house is ready for new owners. The price is currently fluctuating due to upgrades we are working on. If we do these upgrades, the price will be going up. This price reflects an “as is” cash purchase. If you want to get in on the lowest price, act now! 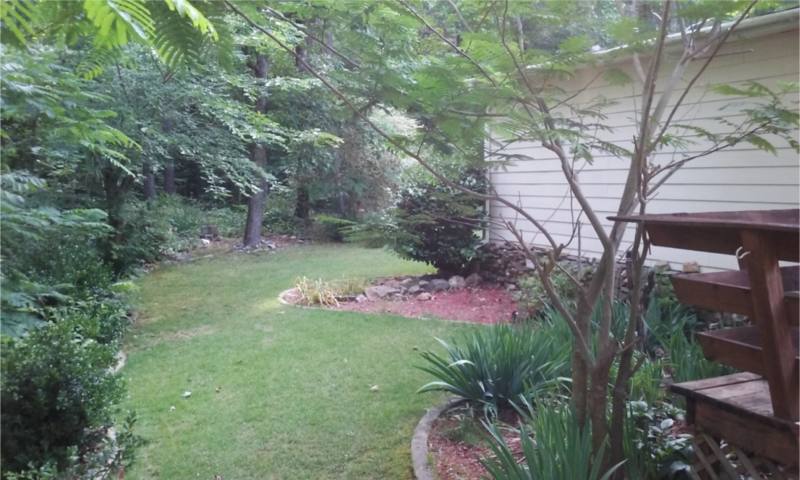 A similarly sized house (just down the road) is listed for sale at $135,000. Anyway, this post features pictures and descriptions so you can get a better idea of what the house and property looks like. If you click on the pictures you can see a larger version. The photos were taken with my phone and I am better at photographing crystals than houses. Just saying. Also, these photos are from last year because there was furniture left in the house that made for cluttered photos and the landscaping wasn’t kept up with like we like it to be. 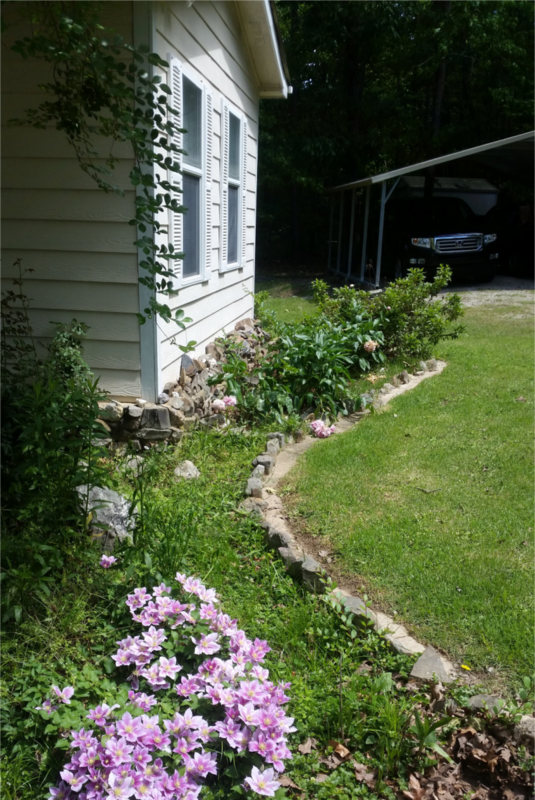 The flowers are actually starting to return (after Patti only having been there about a week!) but I think they didn’t grow as well as previously because the fairies weren’t happy. This is the front of the house. 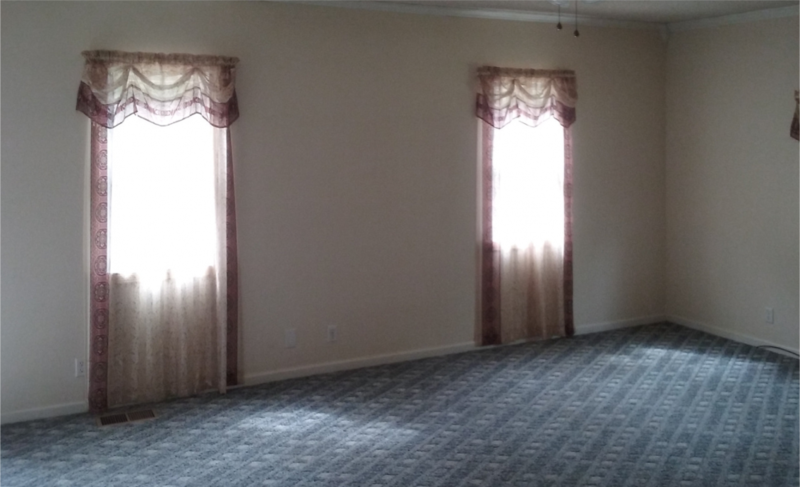 The part that sticks out on the left is the living room, the part that is sunken in (in the middle) is the hallway and the part on the right is the master bedroom. Looking down from the top, the house is an upside down “U” shape (except square, like a house, not a “U”!). The lighting in this picture makes the house look a little pink, it is actually a light light yellowish color, more representative in the other shots). 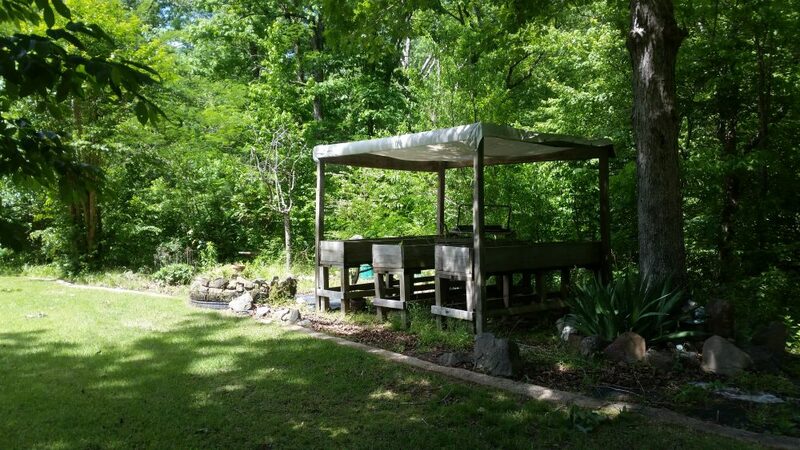 The next picture is the raised garden area. The canopy has now been removed (sad face). But there are large tomato plants in there. And a bunch of nice crystal points sitting at the base of the beds. We intentionally left them for the fairies. From the look of things, the fairies haven’t been tended to. But not everyone knows about the fairies. We are making amends to the house, land and fairies. Poor fairies. We love you! I discovered that it is hard to take photos inside a house! Here we go! 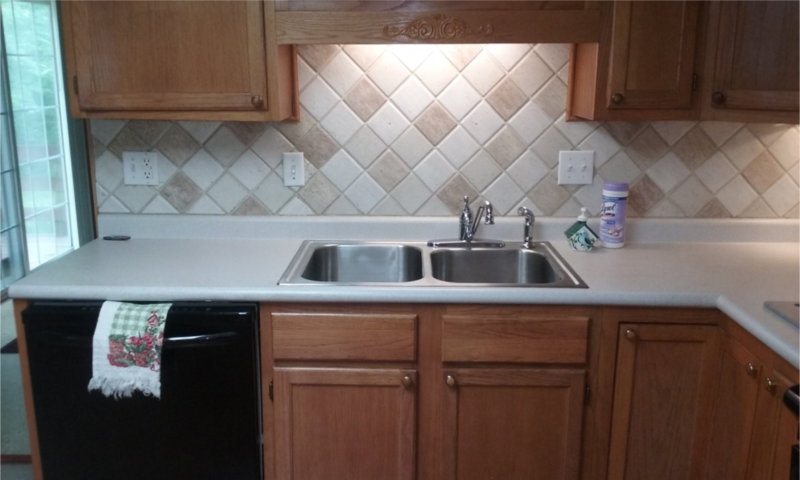 Next is a shot of the sink and dishwasher. 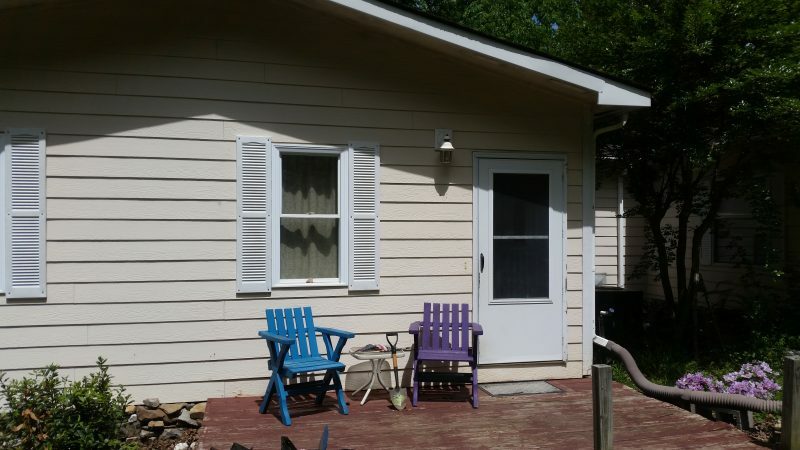 You can see the door to the dining room and the slider to the back deck. The slider has been replaced with a brand new one that doesn’t have the crisscross panes. Just solid glass (and a screen). It has slat type vertical blinds that slide open and shut. Next up… Uh-oh! Look at the chips. Those can’t be mine, right??!! haha! But there is Kashi there, sooo that makes the chips ok, right!? Right! You see the stove is electric. To orient you, the wall there behind the stove is the living room wall. 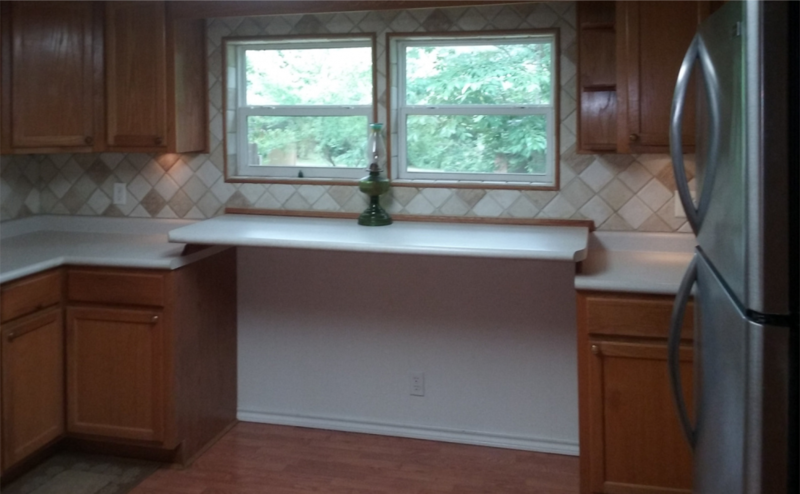 The next picture is the wall to the right of the stove, looking out. The silver refrigerator wasn’t working well so it has been replaced by a brand new, larger one that is the same style (freezer on top), but it is black to match the other appliances. All appliances stay with the house. 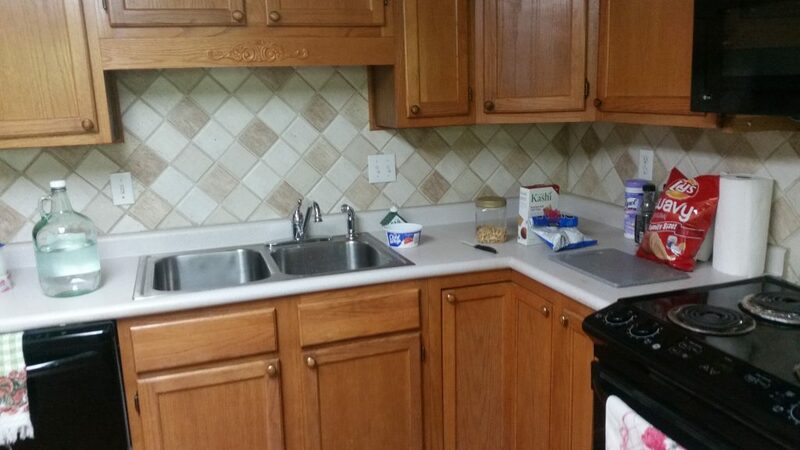 Below shows the rest of the cabinets. Loads of storage in this kitchen. 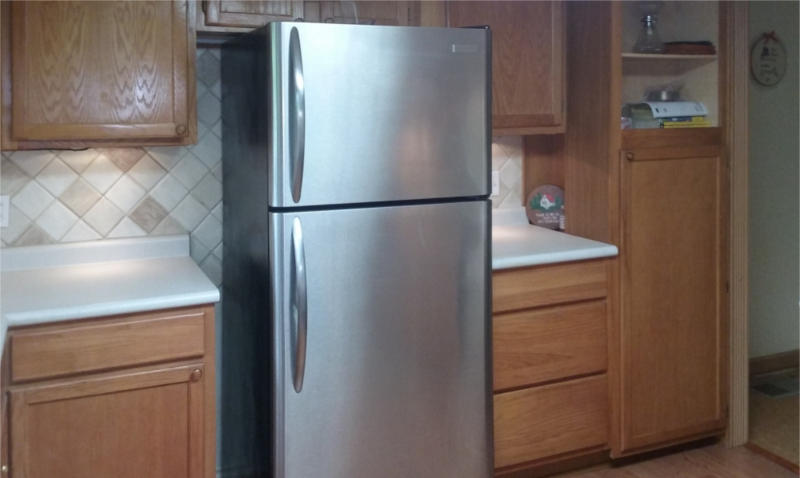 The new refrigerator fits in the space, so it is larger than the one pictured. Pretend that this refrigerator is black and comes to the edge of the counter top. The cabinet drawers all roll out really smoothly. Joyous. Next up is a shot of the dining room, taken from the living room. There is a step up from the living to dining. Kitchen is to the left, straight out is the back deck as you can see, and to the right is a hallway. The floor in the dining room is all new, sub flooring and all, (my partner Patti did it! Nice work!) and with cork on top. Nice! 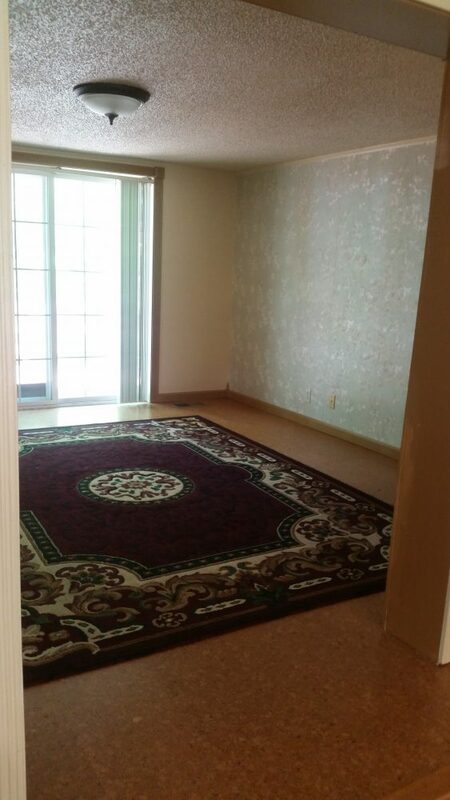 The area rug stays with the house but you don’t have to keep it if it doesn’t speak to you. The next picture isn’t great, but if you turn around in the photo above, this is what is behind you. The step down into the living room. The double doors on the left go to a very large walk in pantry (what? more storage space!?) Straight ahead is the front door and through the entryway to the right is the rest of the living room. Below is the part of the living room that you can’t see from the above photo. There is another window to the right, you can see a peek of the curtain. Are you enjoying your tour? Can I offer you some potato chips? There are some in the kitchen. The photo below is a shot from inside the dining room. I see you might be a little dizzy, (or are you tearing up with joy!?) your vision is getting blurry! I should get you a glass of water. It is from a well and tastes clean and lovely! If you blink a few times maybe your vision will clear up? The next photo is looking in the office or smallest bedroom (your choice). The window looks out onto the back deck. Not pictured is a closet in the back right corner. 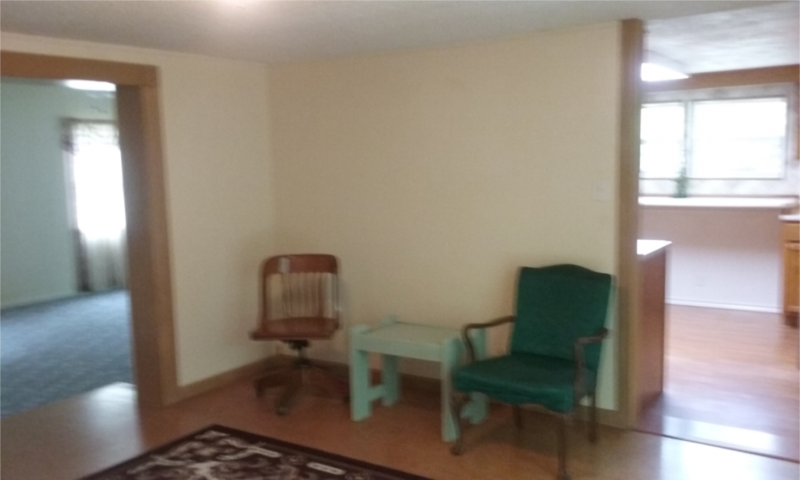 Moving down the hall, to your left, is another small storage closet, you pass that and there sit the washer and dryer which also stay with the house. They’re kind of old but work just fine. I didn’t get a picture of them. 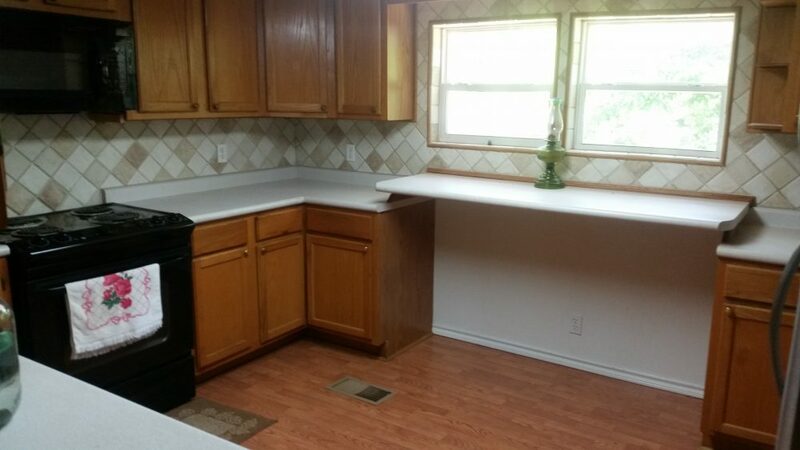 There are cabinets over the washer and dryer, and just beyond them is the main bathroom. We’ll go there next. Judging by the way the next photo looks, I see your vision is getting blurry again! Don’t worry, the tour is almost over. Do you need to sit? 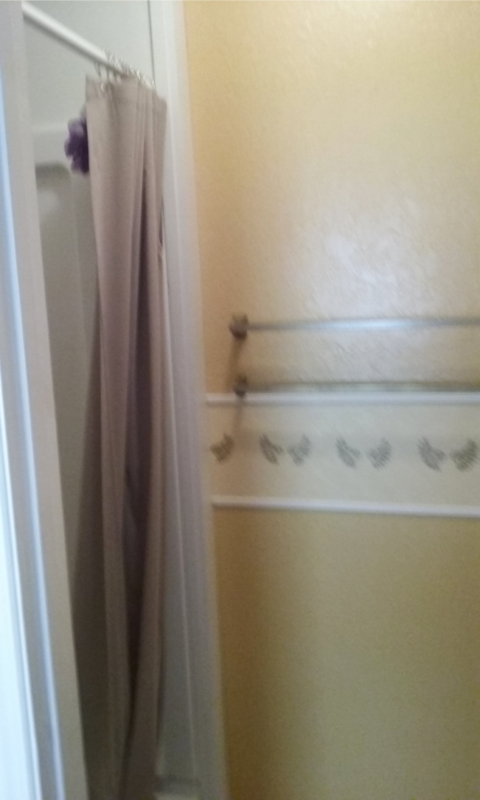 There is a toilet to the left in the photo next to the tub and shower. 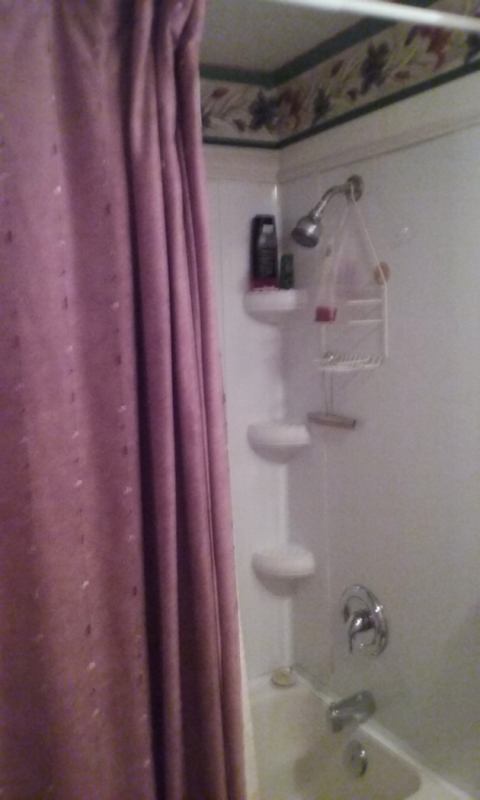 Below is the view inside the tub and shower. 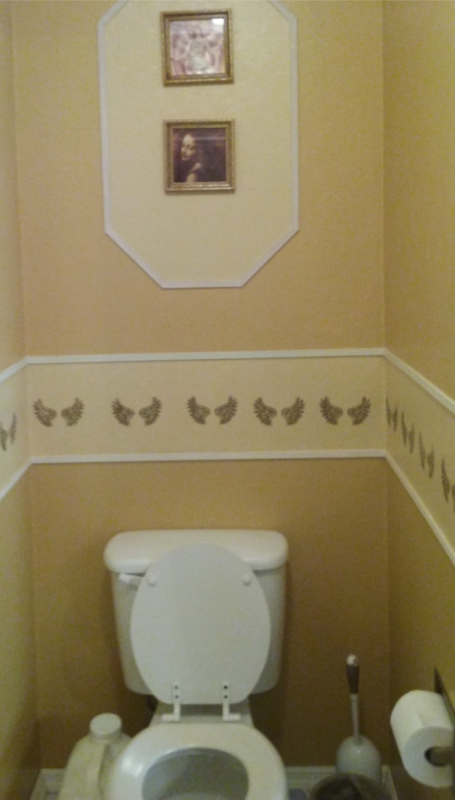 The commode is to your left if you need to sit. Blink a few times to clear your vision. Let’s move on down to the end of the hall, to the small bedroom. Next is the small bedroom as promised. 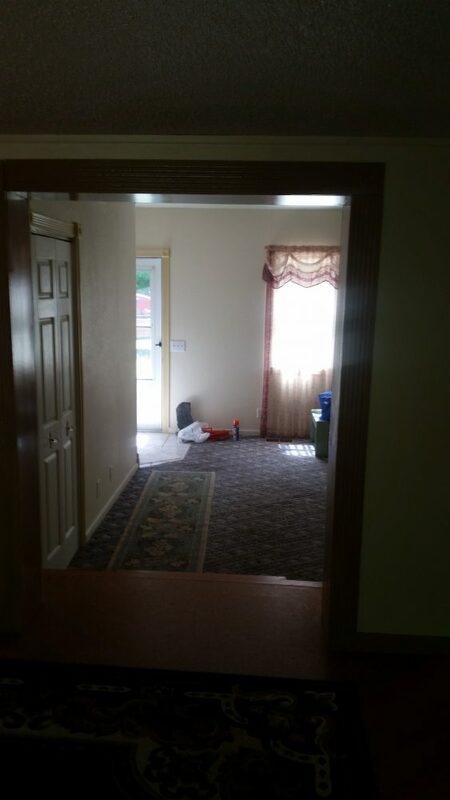 The entryway to this room is at the very end of the hall. 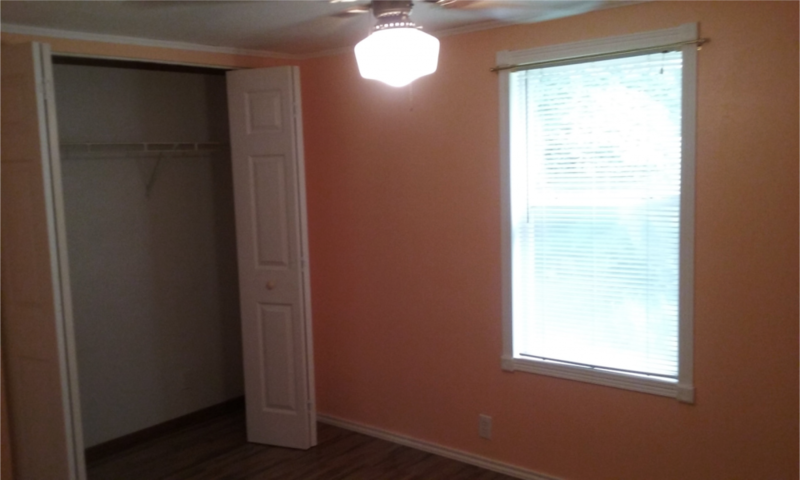 This room also has a small closet with the hot water heater in it to the left of the large closet pictured. 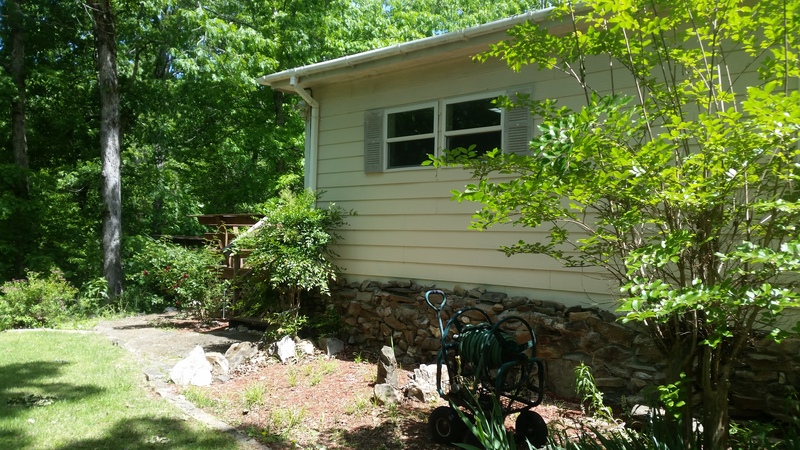 The window looks out on the end of the house where the carport is. We’re at the opposite end of the house from the kitchen. This is inside the master bedroom. 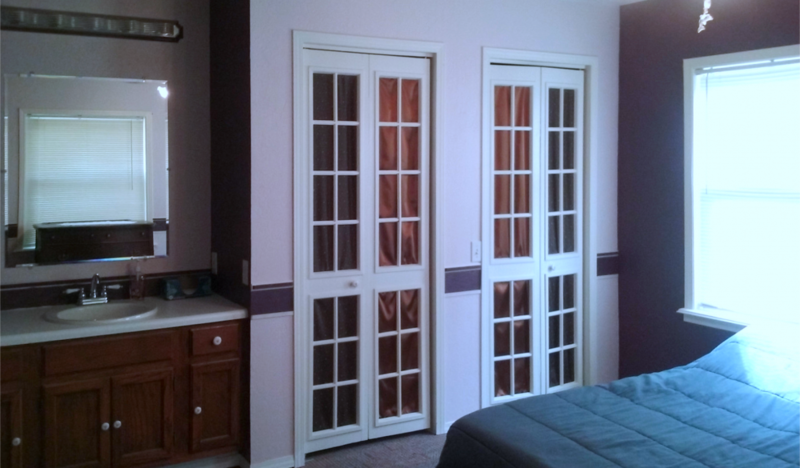 It has a very large closet with double doors and wire closet organizer with shelves and clothes racks for organization. 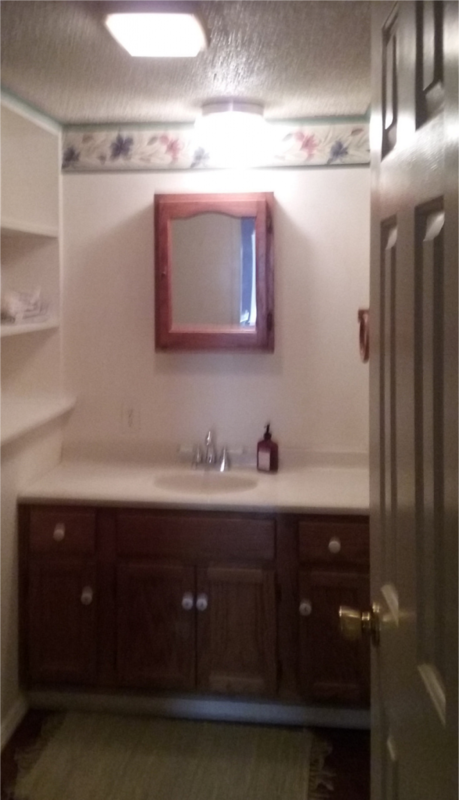 There is a vanity and sink, and to the left of that is a small bathroom with a toilet and a stand up shower (no tub). 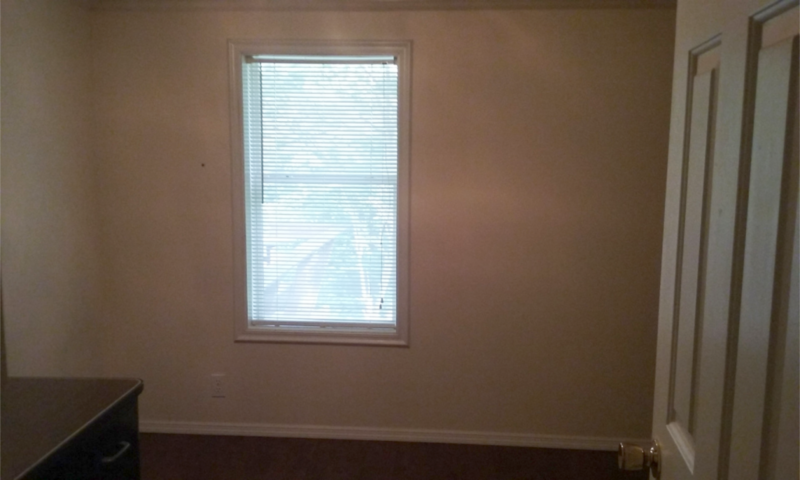 There are three windows in this room. One on each side of the bed and one on the wall to the right. The two at the head of the bed look out onto the front lawn. The one on the right looks out into the little indented area (the inside of the square “U” shape that you saw in the beginning). Oh look! You can see the third window in the vanity mirror. Surprise! Below is the toilet. I wish I had shut the lid. Apologies! Turn right and you are out, into the bedroom, with the vanity on your left. Well, kids, that about covers it. 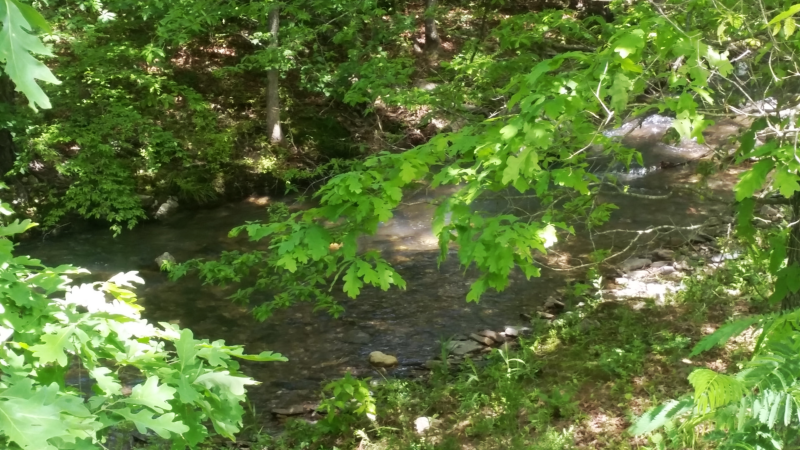 This is the creek. Makes such a lovely sound. Can you hear it? 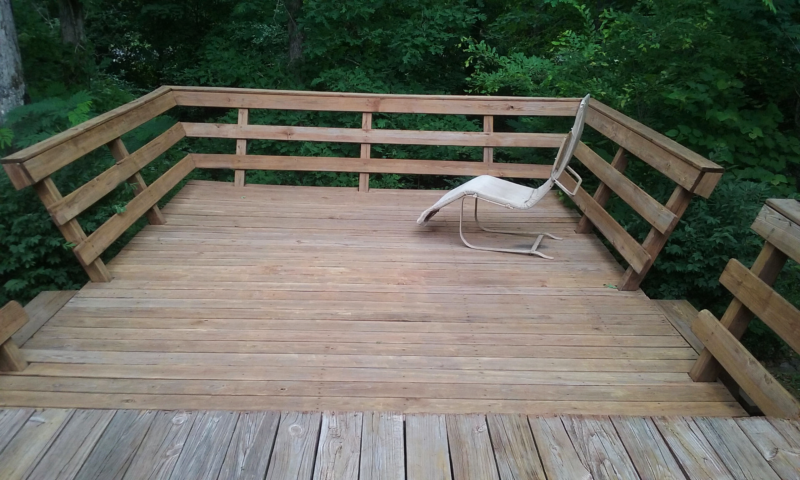 You can sit there on the deck and listen to it burble. And the birds chirp and there are always lovely lizards visiting. They like to sun on the deck. 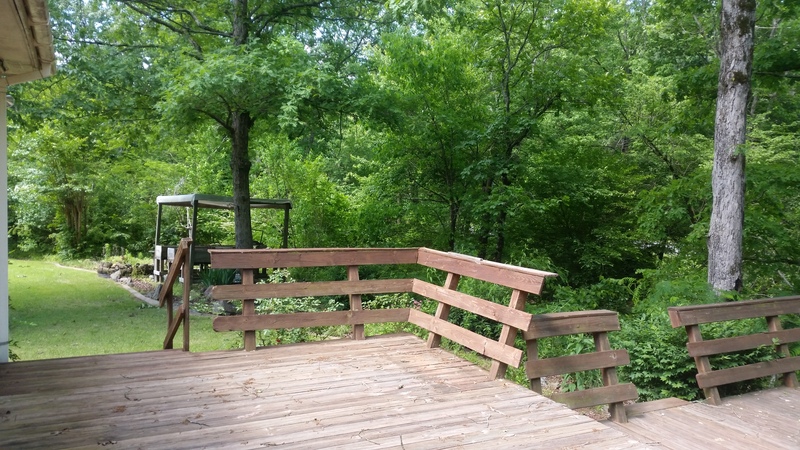 Next up is another shot off the back deck, you can see the storage/work shed. There used to be a very large workshop in the kind of bald space in front of it (behind the big tree). 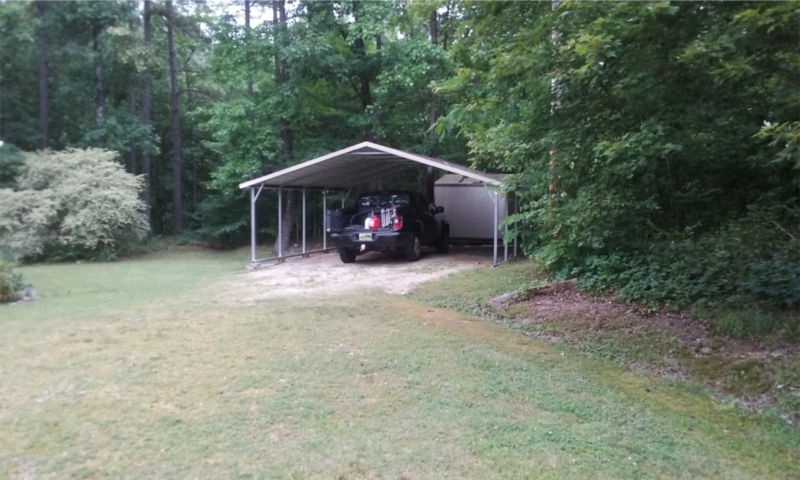 That is why the shed used to be so far from the house. There was a smaller cottage to the right there where the other bald spot is. So both of those areas are level, wired and ready for workshops or? The little brown hut looking thing beyond the raised garden bed is the well house. We’re looking for someone who will love this home and love and care for the land. The fairies, plants, trees and the wildlife need that. If you have kids, the school district is Cutter-Morning Star, from what I hear that is a desirable district to be in from what the realtor told us last year. I don’t know anything about that, though. It’s about 2.5 to 3 miles away. That being said, I see this more as a retirement home or vacation/second home for a couple. 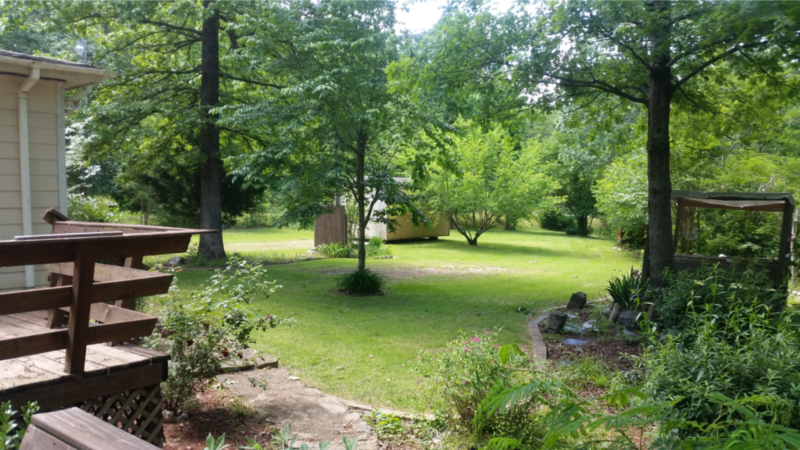 The benefit to this property is it is very secluded and feels like you are WAY out in the National Park, but you are about 1.5 miles from the interstate. Little Rock is under an hour (Sir Google says 54 minutes, but I think that is to the center of Little Rock). Benton, which is a suburb of Little Rock is about 30ish minutes? Magic Springs Amusement Park is about 4 miles. 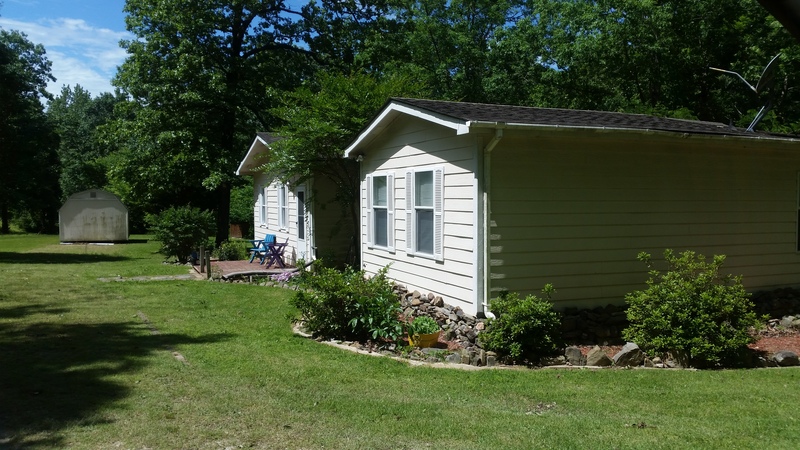 It is about 6 miles to downtown Hot Springs and a scenic 30 to 45 minute drive to several crystal mines. 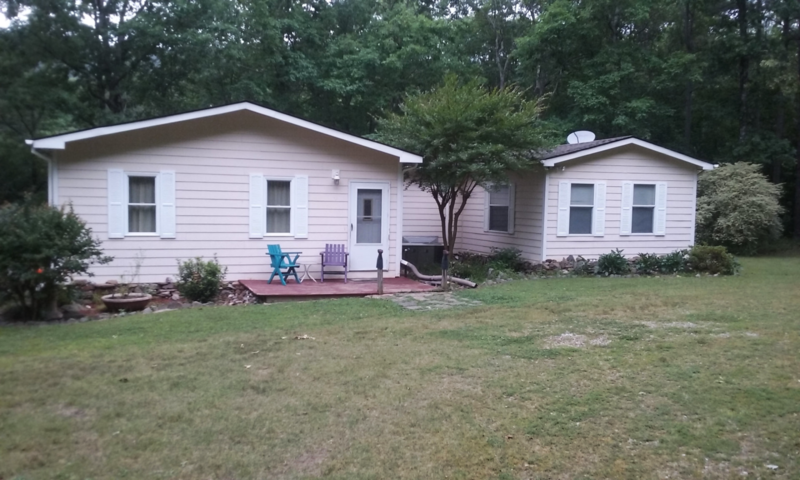 For the nitty gritty, we’re looking at a 3 bedroom, 2 bath, 1352 square foot home on 3 acres. Bonuses: the 2 storage buildings, a 2 car carport, the leveled areas perfect for placing large workshops already wired for electricity, all appliances and lots of crystal left intentionally for the fairies (and the new homeowners). Also, crystal has been found naturally occurring on the land (!!) I also forgot to mention that there is new duct work throughout and new plumbing which is still under warranty with new shut-off valves and access doors. 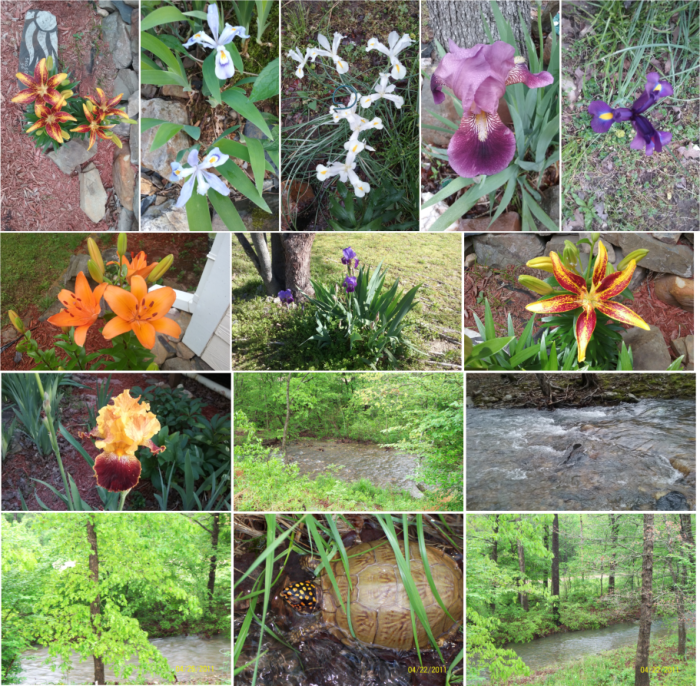 Here’s a montage picture of some of the flowers that were there when Patti lived there. The landscaping will need some replanting because the person who lived there this past year wasn’t a fan of flowers. Some of the bulbs are still around that can be replanted wherever your heart desires. Some of them are already taking root again, even though they were dug up and left in a heap. The flowers do well there as you can see when tended to and loved! If this sounds like your dream home, drop me an email at genn@arkansascrystalworks.com and I will answer any questions you might have! If you’re wondering why we are choosing to sell, it is because I can’t bear to even THINK about moving the tons of crystals I have here where we live now!! 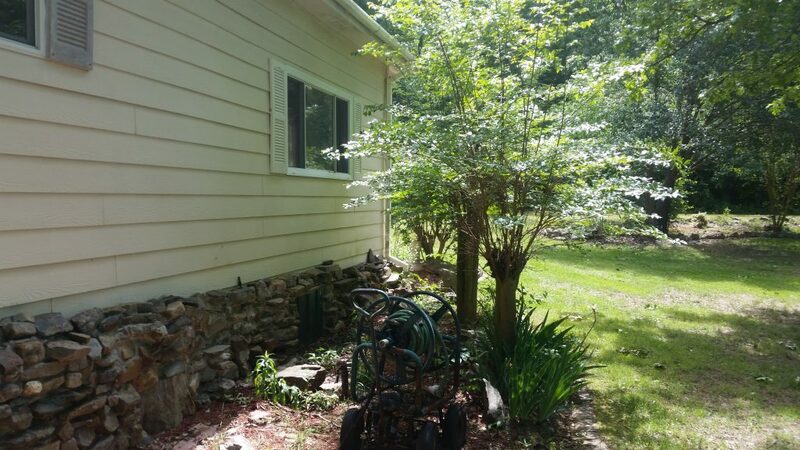 It’s a wonderful home and property, and we love it. We are looking for someone to love it as much as it deserves to be loved. If you have more questions that I didn’t address here (or need clarification on something), please don’t hesitate to ask!